For the theme of 'Modify' I intensively researched (spent 5 minutes on Wikipedia) UK athletes who won silver medals at the Beijing Olympics. What sort of surgical modifications could they make to ensure gold medal winning performances at the London 2012 Olympics? Germaine Mason won the silver medal for High Jump in the Beijing Olympics. 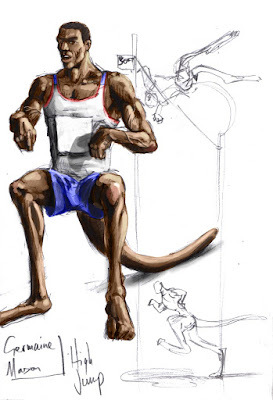 After certain zoological-antipodean-surgical-marsupial-modifications he'd be certain to win the gold in London 2012. 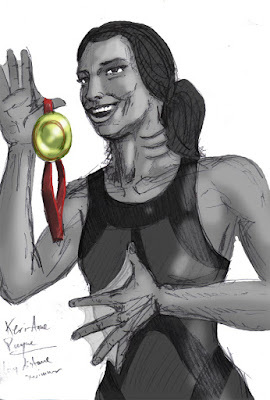 After having webbed fingers and gills grafted onto her body, Keri-Anne Payne hopes her modifications will give her an advantage and win gold for the UK. Whereas Phillips Idowu has taken a rather extreme attitude towards performance enhancing modifications. 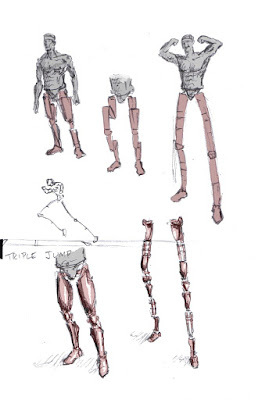 He hopes that by sacrificing his legs from the hips and replacing them with extendable bionic super-limbs will give him the edge it takes to win gold for the triple jump.